I'm so happy to see the rugosas blooming! They remind me of the beach since they bloom along the shore. I have two shrubs; these are from the smaller shrub. Though it doesn't grow very tall, it has prettier flowers for a painting. To the left is the branch I clipped to bring inside for this botanical. There was a firefly on it and tonight while posting this, I see their lights winking out in the yard. Roses and fireflies mean summer is near! 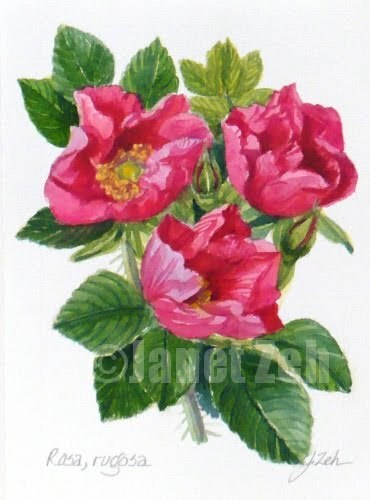 You can get this botanical as a painting or print in my shop at Zeh Original Art Shop.